At 911 Water Damage, our Certified Technicians are on call 24/7, equipped with fully loaded emergency units, ready to handle all type of jobs any time of the day. We will arrive within 45 minutes to start immediately with water extraction, to enable dry out of the affected area and avoid further damage. 911 Water Damage is aware that immediate and expert attention needs to be given to leakage and overflows from water heaters, dishwashers, refrigerators, washing machines, roofs and sewer backups. Problems can arise if the drying of water is not handled in the correct manner. If the right process is not executed correctly the restoration of your home or business will take longer and be more expensive than you expected. Wether it's brought on by natural disasters, a burst pipe, or an accident caused by simple human carelessness, water can have a damaging effect on your property and personal belongings. 911 Water Damage experts will immediately respond to any water damage emergency situation and develop a plan tailored to your specific restoration needs. We do everything in it's power to ensure that your property is restored back to normal. 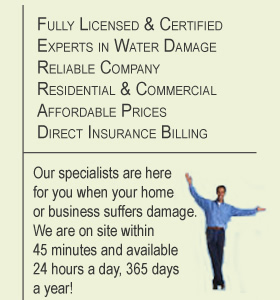 After all you don't want to pay for water damage services only to have problems left behind. Even if you are not working with an insurance company, we will provide standard industry pricing for the services you need. 911 Water Damage will help you with 24 Hours emergency response, emergency plumbing services and pipe burst repair Leak detection using cutting edge technologies, removal of property & storage services, water extraction, assessing flood damage, drying and dehumidifying flooded areas, deodorizing, mildew and odor control, complete property restoration and direct insurance billing. 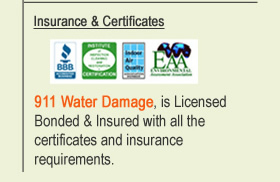 Call us today for a FREE consultation on our water damage services and learn why 911 Water Damage is one of the most highly respected companies for water damage.